UGreen 7 Port USB 3.0 HUB (5V Power Supply) UK expand the possibility to build more connection and transfer data with external device such as USB thumb drive, USB card reader, external hard disk, cellphones, mouse keyboard and other USB adapter; It support transfer rate up to 5Gbps, allows to handle the massive data transfer with high efficiency and less time for you to wait; Backward compatible with USB 2.0 at 480Mbps; The LED light indicates the connection status for your management. 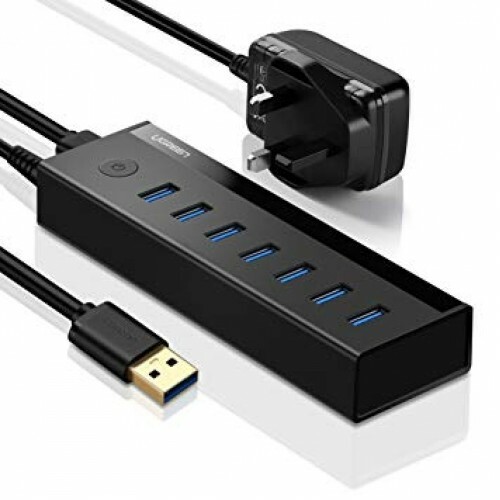 Universal compatibility, ideal USB ports expansion for devices such as , NUC, tablet, laptop, Desktop computer with operating system such as Mac OS, Windows 10 / 8 / 7 / XP, Linux; The 5V 2A power adapter supply power to the hub when connecting with high power consumption devices, e.g 3.5' hdd. This port is flexible with extension cable, 1m USB 3.0 cable allows you to place the USB hub at your favorite spot near your host for easy reach; Compact body design that will save up the space for your other devices;"